A selfless act by a Massachusetts state trooper is going viral for all the right reasons. 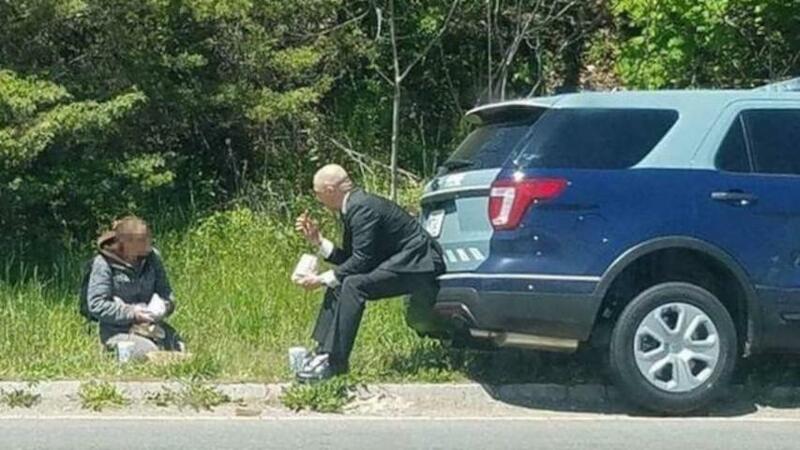 The Massachusetts State Police shared a photo of a state trooper sharing a meal and conversation with a female panhandler on the side of the road. Although it is unknown who took the picture, the Massachusetts State Police the department did some investigating to uncover who the Trooper was. The department discovered the man pictured is Trooper Luke Bonin, assigned to the State Police Dartmouth Barracks. When the department reached out to Trooper Bonin he was surprised that someone had taken his photo and told the department he wasn't seeking or expecting any publicity for the action. According to the Facebook post, the woman was holding a sign and asking for help. When Trooper Bonin drove past he went directly to a local establishment, ordered two meals, and returned to eat with the woman.